Not long ago, Cherry Hills Community Church was named the fastest growing church in the United States according to Outreach Magazine. While their space is beautiful, a poorly designed PA system installed only seven years ago left the quality of experience to chance based on where a first-timer or member chose to sit. As such, the existing solution had compromised the weekend experience, and addressing it became a high priority. Based on how recently the PA was installed, it was with great trepidation that the church embarked on a journey to replace it. The previous solution was selected based on an off-site demo given to senior leadership, and they had no idea how poorly it would translate into their room. Therefore, it was a non-negotiable that the potential updates would have to pass a live demo in their room. 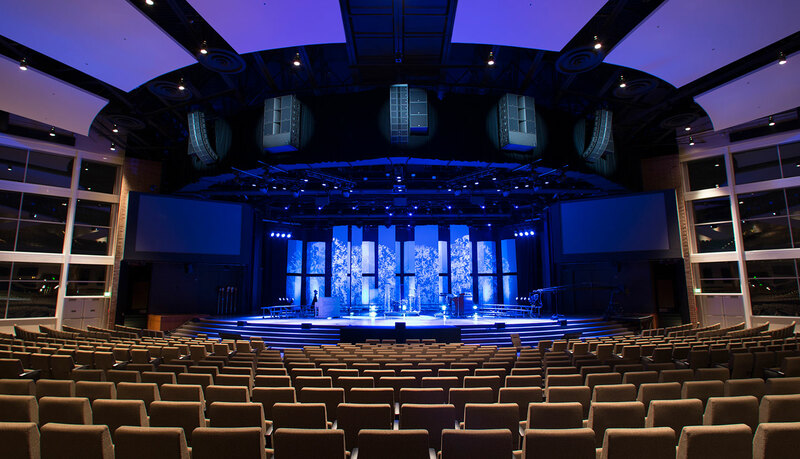 After considering multiple manufacturers and listening to three potential solutions with different price points, the church chose the L'Acoustics KARA solution because they believed it most accurately represented the tone they were looking for in their space. At both soft and loud volumes - every instrument, the richness of the vocals, and even tape hiss from one of the tracks played - consistently translated natural and true. Because this system was being installed in an active room hosting three services per weekend, the changeover had to be executed over the course of a six-day week. Prior to this, Mankin installed all boxes not competing with the original system, and completed cable pulls and pre-rigging wherever possible. The old rig came down Sunday afternoon of install week, and the band was playing first rehearsal for the church's leadership team Friday night. A great feature of L'Acoustics amplifiers is their ability to remotely monitor all connected components to ensure correct operation - as well as logging any potential problems for quick resolution - working hand in hand with Guardian by Mankin. The DSP of the system is also FPGA based so that future software upgrades can potentially add additional features, tuning capabilities, and/or voicing’s for the loudspeakers. This was one of the first L’Acoustics systems installed in the US with the new, higher output KS28 subwoofer and LA12X amplifier. In fact, the manufacturer actually stepped in to help Mankin locate some of the first boxes to enter the country for the church to demo them. Left, center, and right arrays of KARAi boxes are supplemented by front fills and two rows of balcony delay fills. Flown SB18i single 18″ subwoofers act as an extension of the main arrays. Trying to find acceptable floor space for dual 18″ subwoofers for ultra low frequencies was a challenge without a costly stage renovation, so the KS28 subwoofers were flown as well. With other systems this would be a more unconventional solution, but with the L’Acoustics system it was no problem! Cherry Hills also has a very, very large choir that participates in their services many weekends throughout the year. As such, three L’Acoustics ARCS WiFo speakers are flown over the stage for choir monitoring. This was a great solution because it voices identically to the KARA, acting as a natural extension of – rather than competing with – the main PA. The church is feeding the new loudspeaker system from Digico SD10 consoles at FOH, and monitors with Optocore audio i/o interfaces. In the end, we removed five full racks of amplifiers powering the old system, thus rendering a huge difference in power draw due to the increased efficiency of the new amplifiers. Additionally, while the new PA has drastically more output and ridiculously even coverage throughout the room, the new solution weighs 1,200 pounds less than the old system! We’re grateful to call the team at Cherry Hills partners and friends as another great project comes to a close. No longer will a first experience be left to chance based on the guest’s seating location, as the room now sounds as good as it looks!